It is that time of the year again. Fireworks, sparklers, scary masks and costumes are signs that autumn is well on its way and winter not far off. 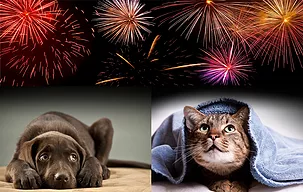 Halloween and Bonfire night are fun events for many of us; but many dogs and cats are acutely distressed by the sights and sounds that accompany these two celebrations. So how can you help them to cope? 1. Make sure your pet is in a safe and secure place. 2. Draw your curtains and turn on the lights. 3. If your pet comes to you for comfort – don’t push them away. Act in a jolly, upbeat way and try and engage them in a game. 4. Don’t punish your pet – this will just confirm there really is something to be scared off. 5. Turn on the radio or television. Music with a repetitive beat can help to distract from outside noise. 6. Try and engage your dog or cat in a game. 7. Allow your dog or cat to hide in a place of its choice. Make it comfortable by putting blankets, duvets, toys and treats there. 8. Thunder shirts, wraps and earplugs may help your dog – but make sure you have desensitized your dog to wearing these before the event, or putting them on might make him or her even more distressed. 9. The use of Pheromones such as Adaptil (dogs) and Feliway (cats) will help to provide an emotionally secure environment. 10. Medication may be useful in some cases, but only under veterinary supervision. Make sure they administered so that they take effect before any noise starts. Don’t ignore the problem just because it happens once or twice a year. You can desensitise and counter-condition your dog to noises they are fearful off. It takes time and perseverance, but you can make your dog’s life happier and more comfortable if you persist.